If a Cancun beach resort vacation with the family means snorkeling, sunbathing, and day trips to some of Mexico’s exciting Mayan ruins, why are you worrying about the dog? At the French-flavored Le Meridien Cancun Resort in Quintana Roo, Mexico, having a pet isn’t a problem. They welcome your two-legged youngsters with a kids-only meal plan and your four-legged friends with charm. Rumors abound that the resort will no longer be part of Starwood and that it may become an all-inclusive. What we do know is that the hotel is currently undergoing a full body renovation, with some anticipated lapses in service. However, we expect this long time family favorite to be back on track later this year. Like many resorts in Cancun, Le Meridien offers guests a comfortable place to put their feed up. With 213 residential-style rooms, each with the standard amenities, there’s plenty of space for families of all sizes. To take full advantage of the beautiful Caribbean setting, consider booking one of Le Meridien’s 12 Laguna Suites. While every room at Le Meridien comes with floor-to-ceiling windows — perfect for looking out over the crystal waves — the Laguna Suites include two balconies with tables and chairs. In the Laguna Suite, you’re sure to get one of the best views the hotel has to offer: Each 900-square- foot suite offers guests a stunning view of Laguna Nichupté. For larger families, if 900 square-feet doesn’t sound like enough space, connecting rooms are available for some Laguna Suites upon request, so be sure to ask about the added space when booking. Are parents and grandparents looking forward to some alone time on their Cancun getaway? Not a problem. Le Meridien’s Penguin Club for kids provides a fun, educational setting for children so adults can slip away for a break. The Penguin Club offers a specially designed poolside area just for kids, including a children’s pool, outdoor play area, and indoor club house. Le Meridien’s professionally trained staff will guide your kids though fun activities like piñata making, castle building, sand/face painting, shell hunting, and freeze dancing. The day begins at 10am and is open to all kids ages 4 to 12. Babysitting services in your room, or out and about the resort, are also available on request. At this a la carte resort, there's always something to do — for a fee — beyond the beach and pool. While your kids are off having fun in the Penguin Club, you’ll probably want to hit up the spa. And why wouldn’t you? Spa del Mar, the in-house spa at Le Meridien has been names as one of the top Caribbean spas by Condé Nast Traveler. Totaling 15,000 square-feet and including 14 spacious treatment rooms, a treatment here is sure to be the highlight of any Mom’s vacation. Appointments are recommended, so be sure to call ahead. If Dad’s not excited about the chance to get a facial, no worries. There's a deep tissue massage of course. But, Le Meridien also offers a wide range of more adventurous activities, including snorkeling, big game fishing, scuba diving, deep sea fishing, tennis on one of the grass-like turf courts and excursions to the golf club at Playa Mujeres. If you’re looking for a way to get out of your resort and see the sights, Le Meridien can help. The resort partners with Destination Management Company to arrange a wide variety of day trips to some of Mexico’s most historic sights. These are guided tours run by local experts, with drivers and vehicles that put safety first. Childcare is available with advance notice so you can go out and enjoy some of the city's great nightlife. When you’re not out seeing Cancun’s sights or relaxing in the spa, you’ll probably want to head down to Le Méridien’s three-tiered Infinity Pool. 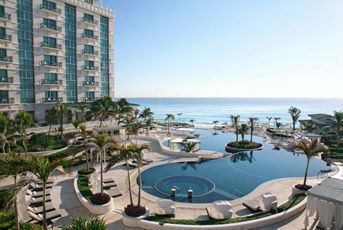 Enjoy some of the best ocean vistas Cancun has to offer from one of the three pools, each with a unique water temperature. Oceanfront Jacuzzis are also available. Le Meridien seems to have something for every member of the family. But what about pets? Le Meridien Resort and Spa is actually one of the few resorts in Cancun to welcome dogs weighing less than 10 pounds (no other pets are permitted). So for a $50 deposit and $60 per night, Fido or PhiPhi can come on the trip too! Just remember that there is a limit to one dog per room. Dogs are also not allowed in the pool and restaurant areas. So your four legged friend has to dine in-suite. What about the rest of the family? With two restaurants and one lounge, Le Méridien makes it easy to grab a bite any time of day. Rememer this hotel company's French roots — the food is excellent at all the outlets at the hotel. Choose from the more sophisticated international cuisine of the Aioli Restaurant, or the more casual family setting of Le St. Tropez Restaurant where you can dine by the pool. For families with hungry kids and picky eaters, the SPG Kids Pass developed by Starwood Resorts (the hotel's owner, at least as of this writing) is definitely something worth checking out. An all inclusive meal plan for anyone under 12, this package offers Le Meridien’s little guests access to a variety of dining options, including children’s menus and unlimited drinks. Families can sign up when they check in, or at any other time during their stay but at this time, sadly, there are no other all-inclusive options at this popular family resort.